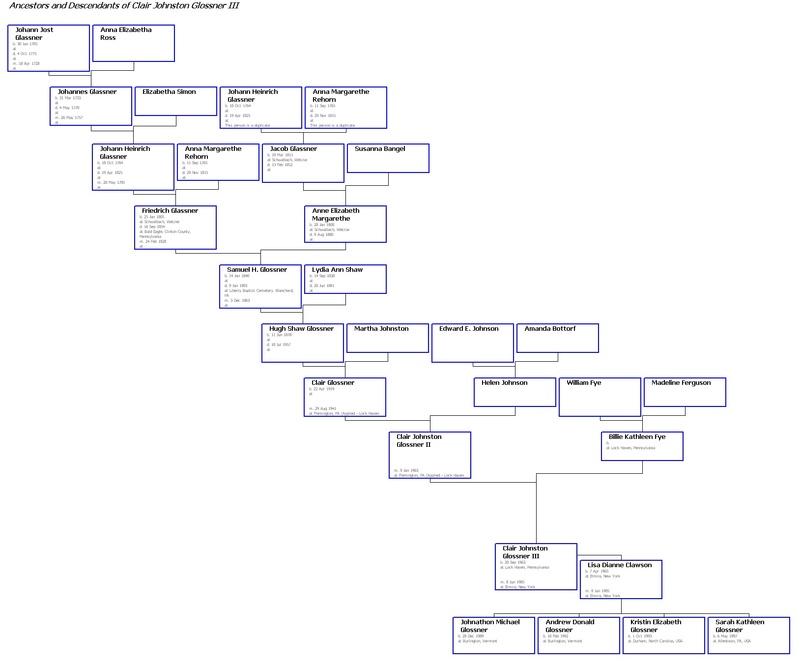 This page traces the genealogy of John Glossner as far back as I know. It seems it started when 3 brothers came from Schwalbach (note that this is not Bad Schwalbach), Wetzlar, Germany to United States. The 3 brothers were Christian Glaßner, Friedrich Glaßner, and Jacob Glaßner. I am a decendent of Friedrich Glaßner. Is it Glaßner, Gloßner, Glößner, or something else? In the US, there are many people named Glassner but few named Glossner. As far as I know (and I thank David Glossner for most of what I've discovered), it appears that Glaßner is correct. This is significant because it seems most Glaßner's are from Prussia while most Gloßner's are from Bavaria (see www.glossner.de). At one time I thought the Kentucky Glossners were relatives but it seems they may be more Bavarian and related to the Nürnburg Glossner Brewery. There was also a Cincinnati Glossner Brewery.